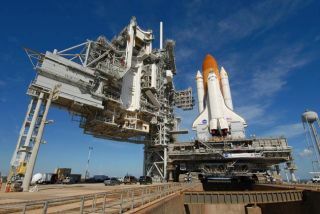 NASA will decide today ifit's safe to launch shuttle Discovery next Friday on an International SpaceStation assembly mission. During a flight readinessreview scheduled to start at 9 a.m., top managers and engineers will pore overdata collected from weeks of testing on propulsion system valves that, ifdamaged, couldput astronauts at risk as they rocket into orbit. They'll determine whetherthe risk is acceptable for at least one mission while tests continue. "It will be dependenton where the data leads the teams, and whether everyone can get comfortablewith a one-flight rationale," NASA spokesman Kyle Herring said. The threeflow-control valves work like pop-up lawn sprinklers to route gaseoushydrogen from the shuttle's main engines through a line to the external tank'sliquid hydrogen reservoir, maintaining its pressure as the fuel is consumed. The lip of one valve brokeoff during Endeavour'slaunch in November, raising new concerns that failed valves could rupturethe gaseous hydrogen line or over-pressurize the tank. Those events could cause anexplosion or early shutdown of the main engines. Engineers at five NASAcenters conducted impact tests and developed computer models to betterunderstand worst-case scenarios and their probability. Today's review resumes onethat began Feb. 3, when Discovery was targeted to launch Feb. 12. The decision was made thento put off the launch to continue testing the valves. A news conference toannounce today's conclusions is planned no earlier than 5 p.m.
During a plannedtwo-week mission, Discovery's seven astronauts will install the last pieceof the space station's central backbone and deploy a final set of Americansolar array wings.